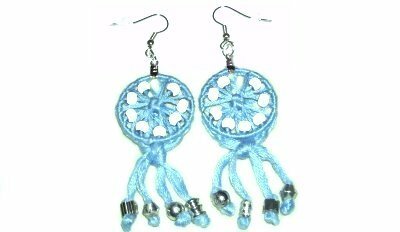 Description: The Dream Earrings are metal hoops covered with Macrame knots. 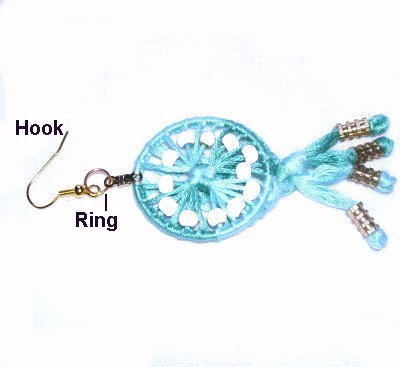 These Micro-Macrame earrings resemble a dream catcher. You can add shells or beads on the inside of the circle, shown as white dots in the image above. 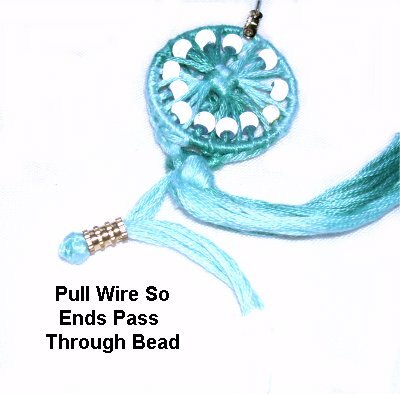 The best way to finish the ends is to apply beads and let them dangle below the hoop. These earrings need a delicate appearance, so use 1mm material. In the example shown, I used cotton embroidery floss. This pattern is rated moderate, due to the fine materials and small size. Make sure you have experience with the knots used in the design. Cutting Instructions: Cut the number of cords listed in the chart below. Each cord should be at least 36 inches long. Prepare the ends with glue and allow it to dry before starting the Dream Earrings. Step 1: Divide the cords into two groups. Match the centers, crossing the cords to form an X. Secure the center with tape or pins. Mentally label the four segments A - D starting on the lower left. Fold segment A over segment B, heading right. Designer's Tip: Notice that I used the Cross Pin Technique to secure the area in the center. This technique is the best method for securing multiple cords, particularly when using delicate material. Fold segment B vertically, over segment C.
Make sure you do not disturb segment A. Fold segment C to the left, crossing over segment D.
Fold segment D forward, passing through the curved portion of segment A over - under. 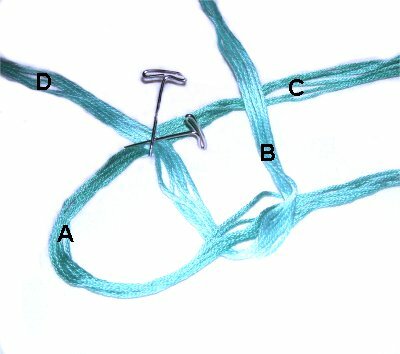 Tighten the Crown knot by pulling on all 4 segments. 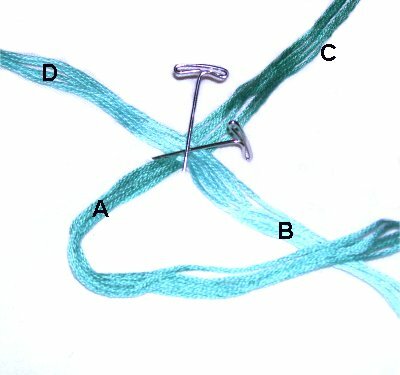 Designer's Tip: All the knots you tie should be very small, so your Dream Earrings will have a more delicate appearance. Step 2: Secure the Crown knot to your board with one pin through the center of it. Spread the cords out evenly, in groups of two. Place the ring on top of the cords, so the Crown knot is in the center. Add extra pins where needed to hold the ring steady. 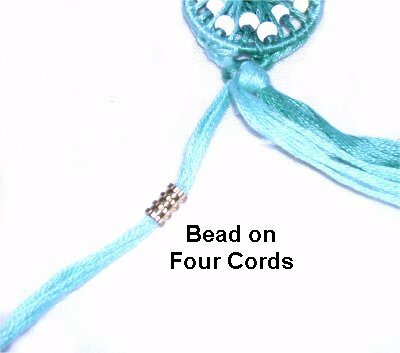 Step 3: Apply a bead to only one cord in each set of two. After you apply each bead, slide it inside the ring. Tie a Half Hitch with the cord, passing it over - under the ring, and over the cord. (counter-clockwise). Hold the first Half Hitch steady while you tie the next one. Then tie 4 more, for a total of 6 Half Hitches. 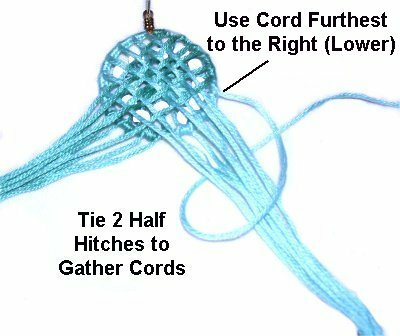 Use the next cord to tie 6 Half Hitches, with no bead. They should rest next to the ones already tied. Move all the way around the ring, attaching all the cords in the same manner. 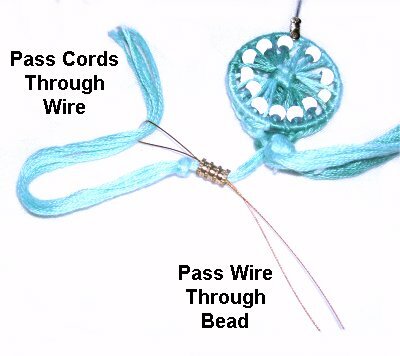 Apply the beads to one cord in each set of two (every other cord). You will be weaving the ends in the back of the hoop so that all the cords are at the bottom when you are through. The cords need to be neatly arranged. Step 4: Organize the cords into four equal groups, after you turn over the earring. Move the cords in the upper right area down to those in the lower left (diagonal). Secure them so they are taut. Weave the cords in the upper left through the diagonal cords from the upper right. 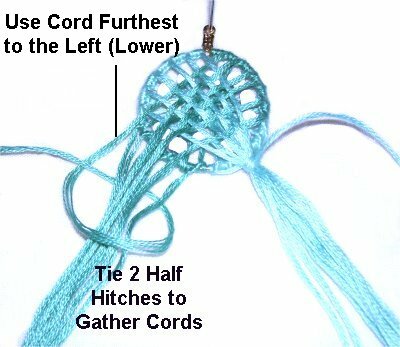 The first cord closest to the top starts the weaving by passing over the next one. 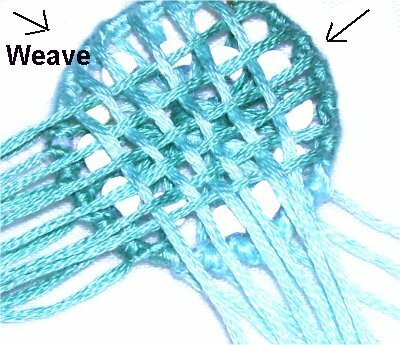 The one below it starts by passing under, so the weaving alternates. After the weaving is done, select the cord furthest to the right. 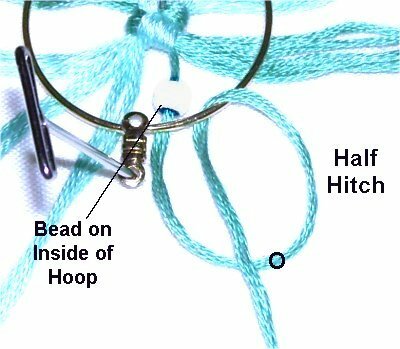 Make sure it's coming directly from the lower right part of the hoop, and is NOT one of the cords you used to weave. 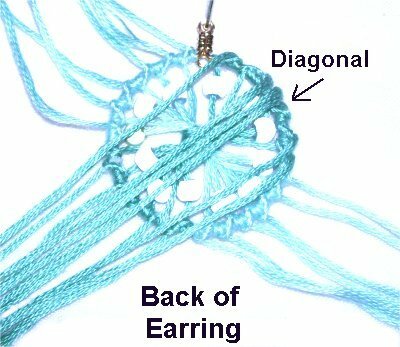 Tie 2 Half Hitches around the entire group of cords at the right lower area of the Dream Earrings design. Repeat the process on the left. 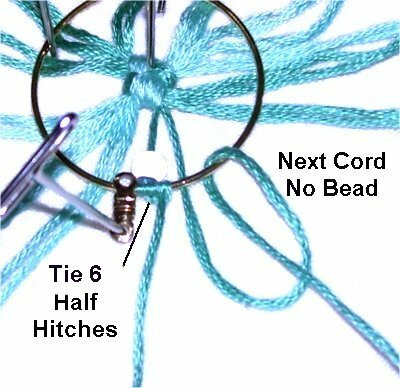 Make sure the cord you choose to tie the knots is coming directly from the lower left part of the hoop. The finishing process includes a knot directly under the bottom curve of the hoop. 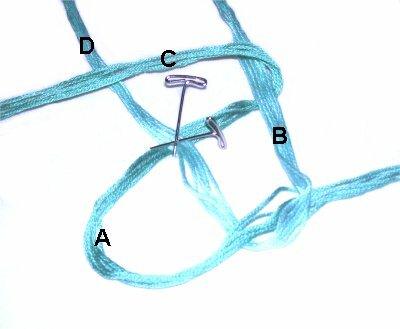 Any knot can be used, as long as it can be tied with the two bundles. 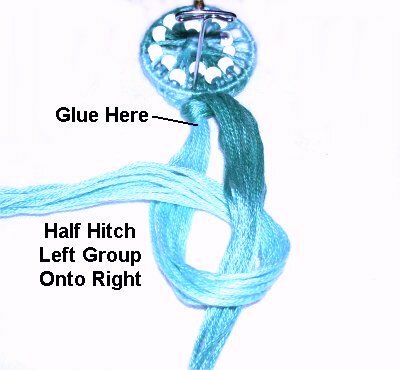 I chose the Alternating Half Hitch, which is shown below. Step 5: Use the right group to tie a Half Hitch around the left group of cords. Before you tighten the knot, apply a small amount of glue near the top of the bundles. Tie a Half Hitch with the left group of cords, onto the right. 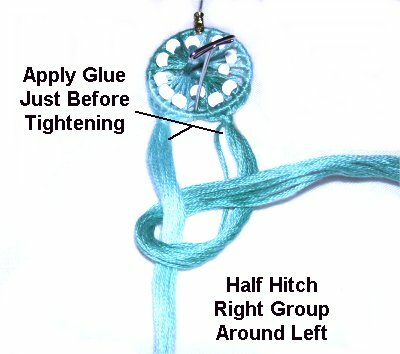 Apply glue close to the first knot before tightening the second. 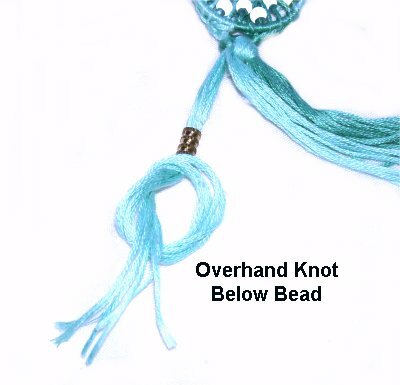 The beads on the ends are optional, so if you are not using them, just tie finishing knots and skip the next steps. Step 6: Trim the cords, making sure you have at least 6 inches to work with. The Dream Earrings look best if the ends are finished and smooth. Divide the cords into groups of four. Apply one bead to the first group, where you want it to rest. Tie an Overhand knot just below the bead, with no gap. Tighten it firmly. 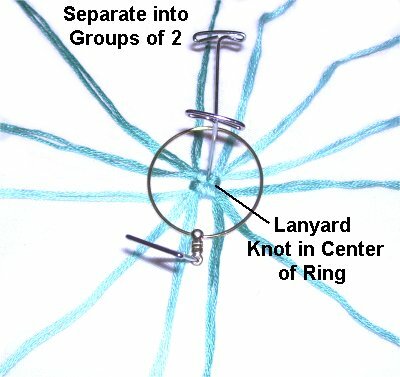 Test the knot to make sure it can't slide through the bead. You can tie a second Overhand knot on top of the first if necessary. Step 7: Fold a wire in half to make a threader. 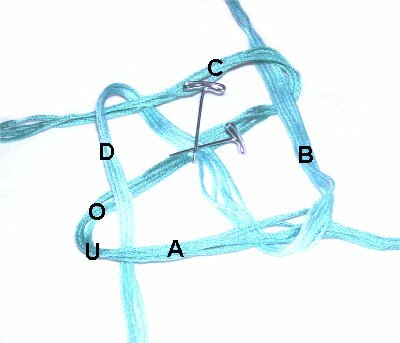 Pass it through the bead, so the folded area is near the knot. Pass the four ends through the folded portion. Push the bead forward slightly, so there's a slight gap between it and the knot. Pull on the ends of the wire, so the cords pass through the bead again, heading towards the hoop. Use the threader to pull them one at a time if you can't bring them through as a group. You may find that the hole in the bead is not large enough, so switch to a different one if necessary. Slide the bead back so you have access to the area next to the knot. Apply glue to the knot and just beyond it. Then slide the bead against the knot with the glue inside. Repeat steps 6 and 7 with the other groups of 4 cords. After the glue is dry, cut off the extra material flush with the bead. Make sure you don't cut the portion coming from the hoop; only the ends are removed. Step 9: Repeat steps 1 - 8 to complete the pair of Dream Earrings (if you want two). Have any comments about the Dream Earrings? Contact Me.